My definition of a crab house is any restaurant that serves hot steamed Maryland-style hard shell crabs. You know that you're in a crab house as soon as you walk through the door, the smell of steamed crabs is in the air and you hear the sound of wooden mallets banging against crab and table as hungry diners crack into the succulent claws. As you look around you see paper-covered tables with trays of cooked bright orange crabs, mounds of discarded shells, pitchers of ice cold beer, shakers of Old Bay seafood seasoning, and bottles of apple cider vinegar. And, yes, there's the occasional basket of piping hot shell-on spiced shrimp! 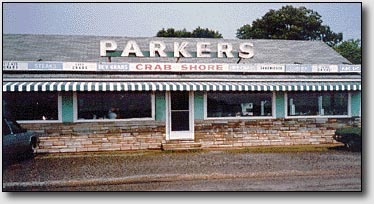 Ah, the memories... there's nothing quite like the atmosphere of a genuine Chesapeake Bay crab house. Most crab houses are located on the water where they can be reached by car or boat, but there are some good land-locked crab houses too. This list is by no means complete as it would be impossible for me to know of every single crab house. So, if you know of a good crab house that's not listed here, please send me a note so that I can include it! Please note that a "Recommended" crab house is one that I've visited personally (or one that a trusted friend has visited.) In order for a crab house to earn a "recommended" ranking, the crab house must serve "steamed to order" hard shell crabs. This means that the crabs take a minimum of twenty minutes to arrive at your table because that's how long it takes to steam up a batch of fresh blue crabs; any sooner and you're probably being served warmed-up crabs. As my good friend Whitey Schmidt always says, "If the crabs show up at the table in ten minutes or less, send them back!"